June was a great month here at Mantra, with ‘The Mindful Living Show’ being a highlight at the beginning of the month. This was our second year at the ‘Mindful Living Show’, a fascinating 2-day event that brings to life different approaches to mindfulness, meditation and new ways of thinking. It is a small enough event that you can get a really in-depth experience in just the one day, if you can’t make both - so do try and come next year, if you can. We were thrilled to see many customers again who came to see us last year. Because we see Mantra as a movement, rather than just a jewellery collection, then we really want to hear your stories of what Mantra means to you. It was lovely to see Faye again, who was wearing her ‘Still, Present, Mindful’ necklace which she bought last year, to mark the start of her learning about mindfulness; and then to see her add to her collection with ‘Hero’ this time, to mark the end of a two-year therapy journey. Read Faye’s story here. I ran my ‘Find your Mantra’ workshop again at the show, and loved meeting many of you who were planning to take the workbook home to work in more depth on a mantra for happiness, a mantra for achievement, and a mantra for life. June also gave us the chance to get more involved with one of our charity partners here at Mantra. Sinade and I were honoured to attend the opening of the beautiful garden at the new Breast Cancer Haven Centre, in Solihull, created thanks to the generosity of a donation from the Estee Lauder Foundation, and to have an in-depth look at the facilities. 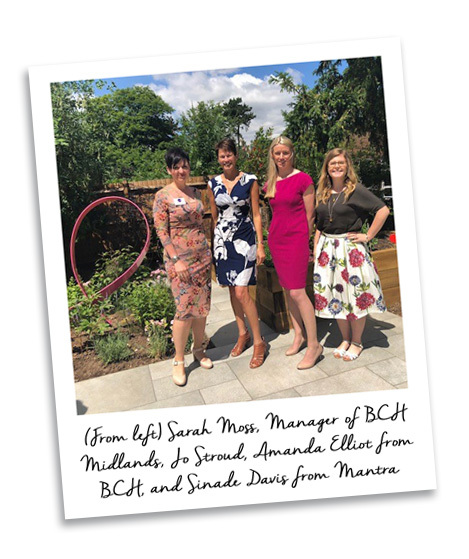 It was genuinely inspirational to see the great work that Sarah Moss and her team in Solihull are doing, to support and enrich the lives of women touched by breast cancer. Read more here. Our lovely heart necklace, with the mantra, ‘You are someone strong. Someone special. Someone loved’, is part of our ‘Mantra Changes Lives’ initiative, with a 25% donation going to Breast Cancer Haven. June also saw me attend an ‘everywoman Ambassadors’ event in London, one of four such events this year. everywoman is a brilliant organisation that I am privileged to belong to, which brings together training, development, networking and campaigning opportunities for women in business. It was everywoman that awarded me the ‘NatWest Businesswoman of the Year’ award last December. At the event, we heard from the remarkable Suzanne Brock, founder of Nutriment – a very successful pet food brand with an industry-leading, premium product. Suzanne inspired us all with the story of her company’s rapid growth. But most of all, she inspired us with how she overcame the enormous challenges she faced during the start-up phase. If any mantra summed someone up perfectly, then Suzanne’s would be ‘Always, I rise’. So - a busy and enjoyable month. I look forward to catching up with you again in July!